• Three office block building, each eight storeys high. The developer has been responsible for several major office developments in the vicinity of this development. Park Place is situated on Hatch Street, between the Iveagh Gardens and the old Harcourt Street Railway Station. In recent years, before the construction of this development, the site housed the Dunlop Tyre Manufacturing Facility and the Dublin School of Music. The design of the development is based on providing approximately 9,000 sq.m. of nett lettable office space on each of the three blocks' deep floor plates. To complement the areas of new build, vaulted sub structures and a platform building were created out of what remains of the former Harcourt Street Railway Station, and these elements have been incorporated into the finished building to provide a unique retail passageway. At an early stage of the base build construction, two of the blocks were reserved by a single tenant. As a consequence, both the fit out contract and the base build contracts were executed concurrently, in order to ensure that all tenant facilities would be available and handed over at the same time as completion of the base build contract. 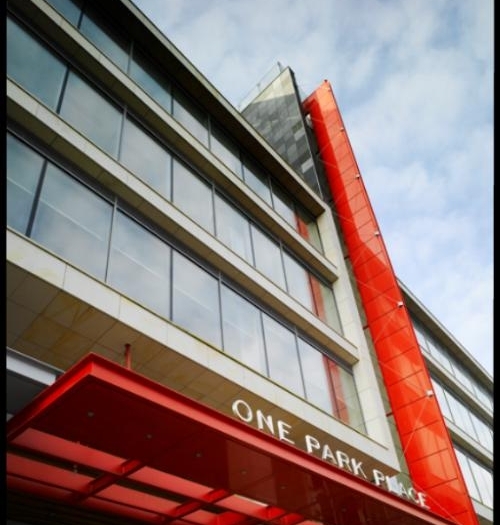 The mechanical and electrical installations in the Park Place Development were deemed worthy of selection for the ACEI Design Excellence Award for the following reasons. The attention to detail of the design and coordination of the mechanical and electrical services, particularly primary services distribution and plantroom layouts. The very positive feedback from the developers, the occupying companies and the building maintenance staff on the quality of the m&e installations delivered. The flexible manner in which office cellurisation and data requirements for new tenants can be easily accommodated within the overall development. It has been demonstrated that this goal can be achieved with minimum disruption to other tenants, due to the approach adopted in the design which permits flexibility and individual zoning of M&E services within the development. The very effective implementation of a strict design, installation, and cost platform on this highly complex project. A design approach which subscribed heavily to creating energy efficiency in use. From a design viewpoint, compliance has been achieved within CIBSE and BRE guidelines. This included a rating of GOOD under BREEAM for Offices 2005 and an Environmental Performance Index of 10.